Fifty years of research has left a legacy of teaching opportunities at the UBC Malcolm Knapp Research Forest. 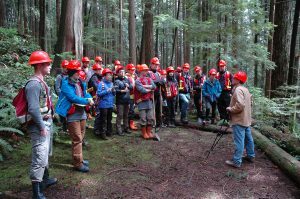 Over the years, our staff has used these opportunities to provide education for many different audiences, including students from the UBC Faculty of Forestry and from other universities and colleges, as well as continuing education groups and local area highschools. We also provide tours to groups who are interested in learning more about forest ecology and forest research. We have used our extensive trail system to create a forest demonstration trail which is seen by many thousands of visitors each year.